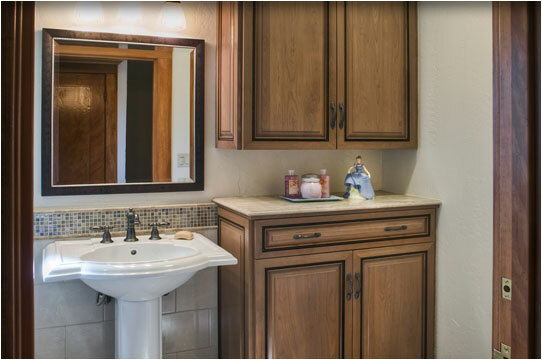 Latest Design Option 2-6, Bathroom Remodel » Roger Perron Inc. Here we have a bathroom remodel, which makes a great guest bath, in a nostalgic design that blends with the original home style. This bathroom remodel was reconfigured to provide adequate space and aesthetics for guests who might arrive. The open pedestal takes advantage of floor space, and the adjoining cabinet with granite top allows for personal items to be spread out as may be needed. The cabinet above provides storage for toiletries. With the bathtub and shower combination (not shown), this bathroom remodel is a great guest bath.